On September 9, 1999 the earth stood still. All eyes were on Sega and the launch of the Dreamcast. 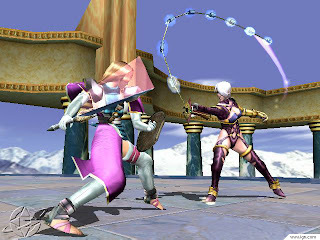 All were mesmerized by the next generation of gaming, and all were hypnotized by Soul Calibur on the store TV screens. This was also the day I started working in the video game retail business. I guarded the precious reserves of DC consoles stacked high in the back of the store. Sega had sent out so many systems that the back room was full, and they had to be piled up on the floor. I too was won over by the mind controlling powers of Sega that day. I too had gotten my hands on the Dreamcast. Never before had I seen so many original games as those we had for the DC, and never would I see so many again. I admit that I was aching for some good RPGs on the DC, but that only made me explore the other options more. 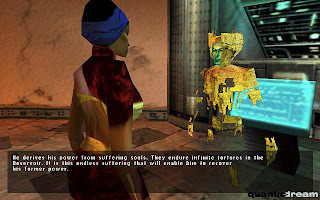 The first Dreamcast game which had a great story and an original concept was Omikron: The Nomad Soul. One of the things that Omikron did differently, was maintaining the existence of the player as just that: a player of the game. That may sound confusing, but it's true. 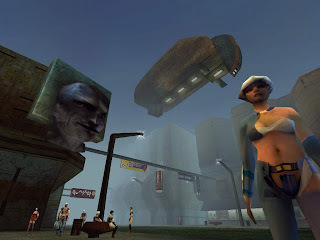 The characters of Omikron remind you that, though their universe is "real", you are accessing their dimension through the game. You, the player, are using the body of someone in their world. Perhaps it was this somewhat different take on the player's role in a game that made it so fascinating for me. But combining this with a beautiful design and a world with dystopian tendencies made the experience addictive. I spent many hours on Omikron. Reviews and friends were not entirely positive about Omikron, and it had its flaws. For how ambitious the concept was, the execution didn't quite live up to it. I was not deterred. I loved this game so much that years later I saw the PC version in a store somewhere and snatched it right up. This was not that long ago, and my replaying of it on the PC was an even better experience in many ways. Omikron was truly innovative in the way it told its story at the time. I would not say that it was the most innovative Dreamcast game though. It would also be hard to come up with the most innovative DC game, as that's a more subjective issue. 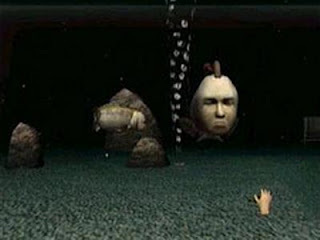 Nevertheless, I think most will agree that one of the most innovative games, even to date, was Seaman. This game, one could say, didn't have a story at all. At the same time, it had a tremendous amount of story, because it was generated by the player. Much as other games, i.e. The Sims, that depend on player generated content, Seaman created a different experience because of the unique method of interaction. Though it was all very limited initially, as your Seaman grew so did its conversational abilities. I distinctly recall talking with Seaman about my girlfriend, for one. This is precisely why the story of Seaman was so good. It was entirely unique to my experience. I talked with Seaman about things relating to me, and this would be different each day. I don't think that the experience would be easily duplicated. The next time I would start the game from the beginning my interactions with Seaman would be different. Not surprisingly, the next big story was also on the Dreamcast. It was delivered to us by none other than Yu Suzuki, and the game was none other than Shenmue. By this time storytelling had come a pretty long way I think. Even now we don't have much that rivals the story of Shenmue. What makes a good story good, is perhaps the way you get hooked on it right off the bat. This might be called a trick, but it works. A good story should hook you quickly, and Shenmue employed this technique well. The premise has your main character, Ryo Hazuki, witness the death of his father at the hands of the game's villain. The bad guy gets away, and that's it. You don't know why it happened, you don't know where the assailant has gone to. This has you emotionally invested in the characters from the beginning, and provides the motivation to follow the clues. 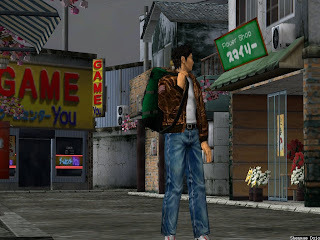 The fact that the world is big in Shenmue, and you can go just about anywhere makes the task daunting. So you just follow the little information you have. Somehow I find this lends a good deal of realism to the experience, and it is this immersing quality that makes it worthwhile. The last years of the millennium were also the time that I built my first computer. Since then it's been one long and never ending upgrade. Many good games came and went on the PC, but after the powerful stories of Dreamcast games, none of them quite seemed to compare in that respect. 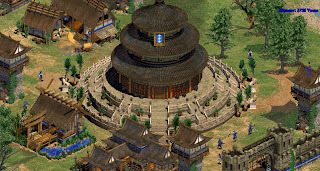 I did enjoy great RTS games like Age of Empires II, which had good historical story elements. I played a lot of Unreal Tournament, which had really no story. Vampire: The Masquerade - Redemption did well enough in delivering an enjoyable tale, though I did not spend much time with it to know of its entirety. In the end it was Diablo II that occupied most of my time, but I always thought the story was one of its weakest aspects. So the PC scene lacked good stories for me at the time. I know that there were probably games out there that would have qualified, had I played them. Of the ones that I did play, story was not the most notable element. The Dreamcast was just about dead by this time, and the PlayStation 2 was the next big thing. 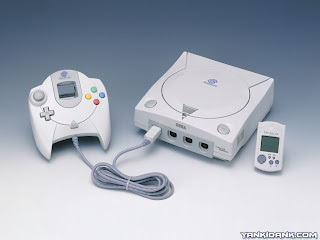 Still in mourning over my beloved Dreamcast, I was not impressed by the PS2 and its meager assortment of games. 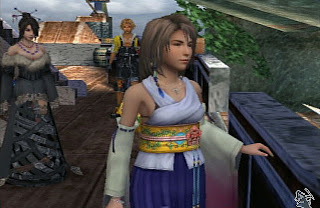 Even when Final Fantasy X came out, though impressed, I wasn't drawn in by its story enough to warrant an obsession. It almost seems like the entire desire to create good stories in games had gone up in the smoke of the Dreamcast's funeral pyre. I suppose that working in the video game retail business had me somewhat tired of games too. Tired not so much of playing them, as I was of the same old formulas used by big companies to just keep profiting from a franchise or genre. Just as story seemed to have died away, so too did innovation. As it often seems to happen, a period of prosperity tends to be followed by a period of recession. This was perhaps what I saw happening. Yet recessions come to an and as well. In summary, the games which get the prestigious Mentis Award for Storytelling are Omikron: The Nomad Soul, Seaman, and Shenmue. Only a few this time around. In the next part of my completely subjective game awards, I'll be exploring the next generation of immersing adventures that consumed our days and nights. Read on!